Lately I’ve had attitude about wicker furniture. I thought I was kind of over it as a style of outdoor furniture. 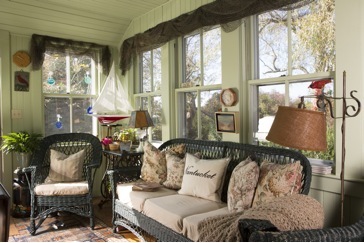 Maybe that’s because, in my last three books, it seemed the “go to” furniture on every porch we photographed. It became a cliché symbol for a romantic, throw back to the great Gatsby era. So I was off it – until this morning. What changed my mind? I used to have wicker furniture on my deck. I don’t know what happened to it over the years, but the other day I was thinking about wicker and ready to revisit my attitude. Part of this change of heart came about when I was organizing pdf files on my desktop and came upon a picture byTerry Pommett. We photographed this room for a magazine article. It really stopped me in my tracks. It’s the porch at Peter Greenhalgh and Stacey Stuart’s house in Polpis and it is so delightfully welcoming, so Nantucket cottage style (right now very IN) that I couldn’t ignore it. Maybe something has to go off your radar for long enough to be appreciated anew. Whatever it was, this picture of the hunter green color, the perfectly right shabby chic pillows, the pale green walls on the porch and the farmhouse style windows just reeks of old-fashioned summertime casual. Then there’s the boat model in the corner and don’t you absolutely love the use of fishnets as window valances? They may even be filled with starfish. 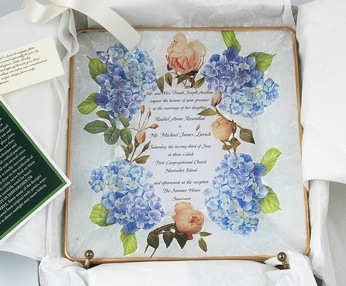 White wicker with rose-covered chintz fabric and lace-covered tables, sheer white curtains and paintings of roses on the walls all evoke a bygone era of summertime at its best. Fresh bouquets of roses in milk glass vases and over-stuffed chairs covered in rose-printed fabric punctuate rooms with just the right color and a sense of romance. My book, “Aged To Perfection” is filled with such rooms. 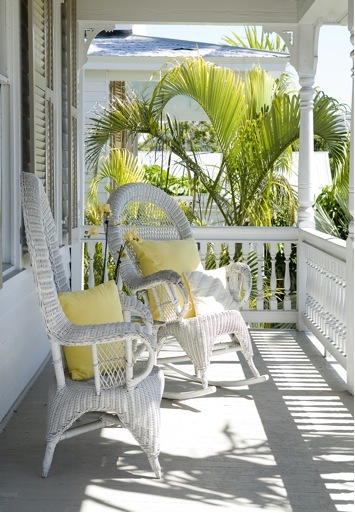 This picture on an upstairs veranda is from my book, “Key West, A Tropical Lifestyle” (photos by Terry Pommett). It’s so typical of what you find on this subtropical island. But, REALLY! Take away the Palm trees and can’t you see this on your Nantucket porch? AND YELLOW! Wow. So soft. So inviting. Add a leafy potted tree for green and voila! You’ve created a seductive spot that positively dares you not to take time for a good read and a glass of lemonade? If you find a wicker piece at a yard sale or someplace that calls the furniture “gently worn” (a euphemism for “used”) it’s real easy to bring it back to acceptable. If the paint is flaking off just rub it away with a wire brush, clean with mild soap and hosing, let dry and spray paint with Rustoleum enamel. Important: Stand 12 inches away and spray back and forth for a thin even coat. You don’t want the paint to glop on and drip. The paint dries in minutes so two or three thin coats are better than one thick one. You will be knocked out by all the color choices. Right now I’m loving celadon green for a contemporary feeling without losing the soft romance. If you choose white, think navy and white cushions for a change. I never thought I’d say it, but wicker doesn’t have to stay outdoors. If you use your house strictly as a summer home, bring it indoors as well. I wouldn’t suggest a whole roomful, but an occasional chair – yes. My friend Jane used one lovely floral green and white fabric on her upholstered furniture. She painted all the wooden pieces glossy white and added spots of yellow. Don’t you love the yellow underside of her porch overhang? A simple orchid is perfect on the coffee table, the only dark piece of furniture in the room. I think this is good – like a drop of chocolate ice cream in the vanilla. Or a little spice in the sauce. Outside there are natural rattan chairs around the table. Rattan is another material that goes well with wicker for a light summery feeling. While this house is in Key West, it translates to a Nantucket style home because the pieces are elegant, stylish, quality and comfortable. Bare floors feel good under bare feet in summer. My favorite summertime bedroom look – sheer curtains that blow in the breeze (I’m not a fan of air conditioning), a vintage wicker rocker, white mattlasse coverlet and the subtlest spots of green in one perfect flower and two botanical prints. If you do up a guest room like this you will have nailed Nantucket style.